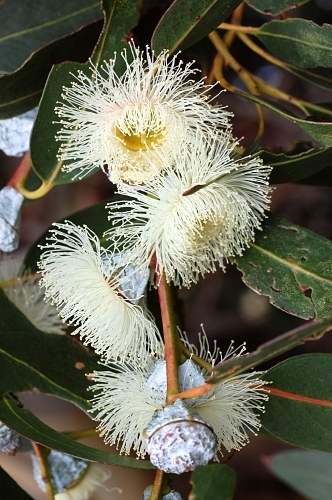 Tasmania’s floral emblem, the Blue Gum (Eucalytus globulus), is a tree of many talents. It has one of the largest blossoms among eucalypts. It is among some of the world’s tallest flowering trees. It is the major source of eucalypt oil and an important source of pulpwood. I could list much more but that would be best elaborated in a post on it’s own. Suffice it to say for now that the Blue Gum is a Tasmanian icon, a view shared by Prof. Brad Potts during a public lecture on the 12 Nov 2009 celebrating 100 years of Biology in UTAS. During the lecture, Prof. Potts expounding on the cultural, ecological, economic and scientific significance of the tree. But while the science and verbal transmission of the Blue Gum’s natural history will appeal to our intellect, and the Blue Gum’s large showy blossoms to our visual senses, there must be more that this world renown tree has to offer. And indeed, few avenues offer as visceral an experience as the modality of taste in enabling an appreciation the Blue Gum’s contribution to Tasmanian culture. There is little one may eat of the Blue Gum though. 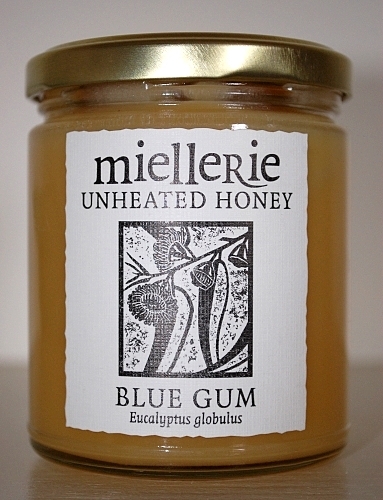 It is possible to make a tea from the leaves of the Blue Gum but my plans to do that was quickly superseded when I saw a jar of miellerie unheated Blue Gum honey sitting at Meredith’s Orchard Fruit and Vegetable market at Margate, South East Tasmania. 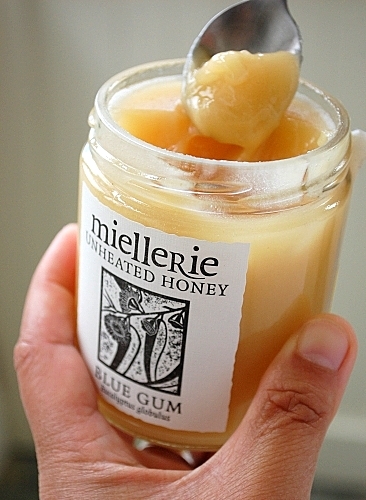 Like the Prickly Box honey I’ve written about in a previous post, the Blue Gum honey was raw and unprocessed. It was however, a little more creamy in texture and had less of an aromatic fragrance. The honey smelled somewhat like the very mildly foetid scent of fresh eucalypt blossoms. The subtle flavor of the honey does not immediately hit one’s tongue. I spread a teaspoonful of the creamy substance on my tongue and proceeded to lather it on my palate. Doing that allowed me to experience the full taste of the honey. The words that come to mind are ‘cool’ and ‘mildly minty’. The light pleasant flavour is sure to be pleasing to some. I have not only seen the floral emblem of Tasmania…I’ve tasted it! This entry was posted in Bush Tucker, Ethnobotany, Honey and tagged Blue Gum honey, Eucalytus globulus, Eucalytus globulus honey, Honey, miellerie. Bookmark the permalink.